The Museum of Church History and Art recently sponsored the Third International Art Competition with the theme “Living the Gospel in the Worldwide Church.” More than five hundred artists from twenty-seven nations entered the competition. Nearly two hundred entries are on display in the Church museum in Salt Lake City until September 5. The entries displayed here focus on scripture reading. 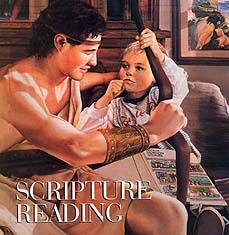 Anciently, the prophet Nephi wrote, “Feast upon the words of Christ; for behold, the words of Christ will tell you all things what ye should do” (2 Ne. 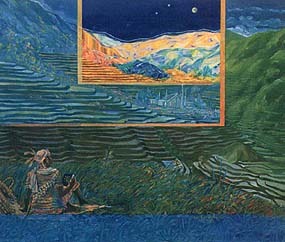 32:3). In modern times, latter-day prophets have encouraged us to do likewise. “When individual members and families immerse themselves in the scriptures regularly and consistently … ,” said President Ezra Taft Benson in the April 1986 general conference, “other areas of activity will automatically come. Testimonies will increase. Commitment will be strengthened. Families will be fortified. Personal revelation will flow” (Ensign, May 1986, p. 81). 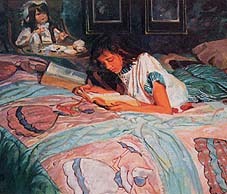 Reading the Scriptures, by Rachel Belt McGrath of Sandy, Utah, oil on canvas, 1993. 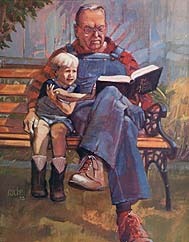 “I wanted to paint Grandpa Belt reading the Book of Mormon to Matthew,” says Sister McGrath. 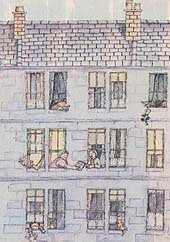 Loving Thy Neighbor, by Joy Rae of Kilmacolm, Scotland, watercolor and ink, 1993. “The gospel shines forth even from the tenement windows of Glasgow, the industrial capital of Scotland,” says Sister Rae. 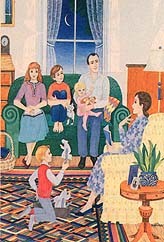 Family Home Evening, by Phyllis Luch of Salt Lake City, Utah, gouache, 1992. “I wanted to convey a sense of intimacy and timelessness; a feeling of wholesomeness and modesty, of comfort without luxury and beauty without wealth,” says Sister Luch.